Boost Mobile has announced new enhancements to its core Anytime Plus mobile plans, offering increased data inclusions and calls to standard International numbers in 50 eligible destinations. “It’s obvious that mobile data continues to grow in importance for youth when considering a mobile network. 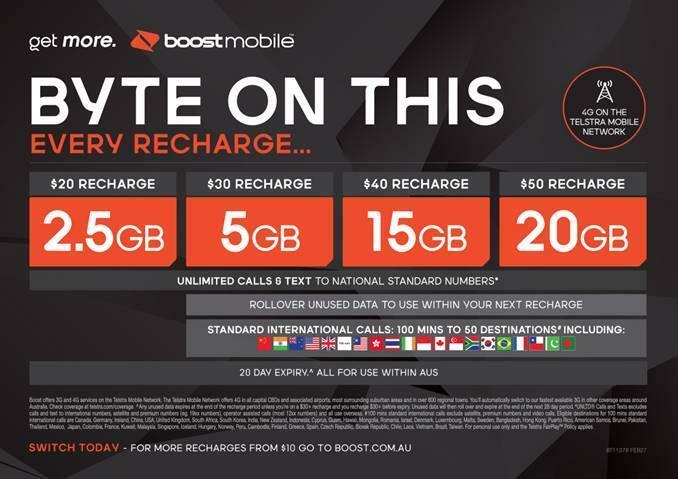 In response, Boost Mobile’s new offers are highly competitive plans that include more data, importantly on every recharge, all on Australia’s best mobile network which ensures the Boost Customer also gets great coverage and speed. We need to tick all the boxes and these new offers do just that“, said Jason Haynes, General Manager, Boost Mobile. "The Boost team is excited to be launching these new offers that will benefit both new and existing customers. We want to make sure we constantly enhance our offerings and provide more compelling choices when it comes to pre-paid mobile plans, giving them more of what they want," Haynes added. The new pre-paid offers will be available from 27th February 2018 online at http://boost.com.au/ or at one of 12,000 retail outlets Australia-wide including AusPost, BigW, Coles, JB HiFi, Kmart, Target, 7 Eleven and Woolworths.